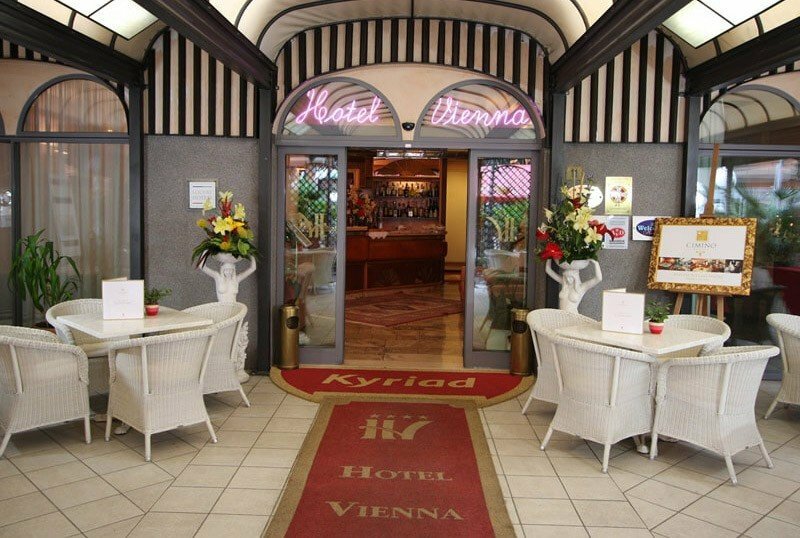 The 4-star Hotel Vienna Ostenda overlooks the Rimini seafront, has a video-guarded parking area, a conference room, a garden and services for children. Pets are allowed. The property is located in Rimini, in the Marina Centro area a few steps from the beach. All rooms are equipped with LCD satellite TV, telephone, minibar, WI-FI, safe, independent air conditioning and bathroom with shower and hairdryer. Rooms with balcony (also sea view), sitting area, shower or hydromassage bath, cable radio are available. AMBASSADOR: located in the inner part of the structure, they do not have a balcony. ROYAL: with balcony, on the side or in the front of the hotel. JUNIOR SUITE: they are located in the renovated part of the hotel and can have a Jacuzzi and a balcony. SUITE: they are located on the first floor and have a large terrace of 35 square meters or on the fourth floor with a Jacuzzi and a balcony with a sea bath. DEPENDANCE SUITE: suite with hydromassage tub. Garden, open-air porch, sun terrace, free bicycles, wellness area with solarium and Jacuzzi for 10 people, 3 conference rooms, reading room with newspapers, lift, beach towel, welcome drink, theme nights, free airport shuttle service and station. PARKING: uncovered (40 seats), garage (2 places), both in the hotel for a fee. AGREEMENTS: beach, amusement parks, discos, gym, spa, law enforcement, shuttle service, organized excursions. PETS: allowed in all sizes except in the restaurant room. Dogs have access to the pet area on the affiliated bathing establishments. LUNCH AND DINNER: the restaurant "Il Danubio" offers fish and meat specialties à la carte, accompanied by excellent wines, with pasta and homemade desserts. VARIATIONS: dishes for celiacs, vegetarians and vegan cuisine on request. At meals: baby food, baby food, baby menu, bottle warmer, high chairs. For a fee: baby sitter and pediatrician. The hotel has three meeting rooms equipped with video projector, TV, WI-FI, telephone, big screen, overhead projector, microphones, sound system, air conditioning and independent heating. All can be set up in a horseshoe, class, theater, cocktail and single table. PEARL ROOM: can accommodate from 45 to 90 people depending on the setting. CAMINETTO ROOM: it hosts from 15 to 30 people. SALA EXHIBITION: with a capacity of 20 to 40 people. The hotel has an agreement with Bagno Onda n. 43, equipped with pet equipped area, gym, muscle awakening, aqua gym, illuminated playgrounds, games area and entertainment. The prices of the price list are per person per day in a double room.